It’s always exciting to receive a fat jiffy envelope with a book-like bulge in it when the mail comes. So when my copy of The Asian American Literary Review‘s inaugural issue arrived last month, I was especially ecstatic to rip into the envelope. Since the editors of AALR announced their presence online earlier this year, I had been eagerly anticipating their first issue. Their pre-release publicity had advertised an impressive lineup of literary luminaries, and I must say that in every respect, the issue has managed to live up to the editors’ promises. I’m going to focus on some of the poetry in the issue in a bit (since this is, after all, a poetry blog), but before I delve into that train of thought, I should note that I immensely enjoyed the prose in the issue, too. I especially liked that the editors chose to began the issue with a “forum” (i.e. a series of position statements and replies) in which three Asian American writers (Alexander Chee, David Mura, Ru Freeman) responded to questions regarding the necessity and purpose of an Asian American literary magazine. I enjoyed following the convergence and divergence of the participant’s different points of view, and in particular, thought that their discussion about whether an Asian American writer must necessarily write ‘about’ his or her ethnicity brought up some very important questions, such as: do MFA programs disservice students of color by teaching them to write toward a “norm” set by mostly middle-class, white models? Or, conversely, do they force students of color to conform their work to an particular “trope” or mode in which “ethnic writing” is expected to operate? I also enjoyed the dialogue sparked by David Mura’s observations about the lack of longevity that has hitherto plagued many Asian American literary ventures. Mura noted two problems that have contributed to this trend: 1) a lack of financial and administrative know-how, and 2) the divided nature of the Asian American community with regards to whether or not to claim a pan-Asian American identity. I thought that Mura’s observations were spot-on. Young as LR is, my work on it thus far has already given me a taste of some of the challenges that he identifies. I was especially struck by his point about lack of administrative manpower. Administratively, LR is a two-woman operation and our solution thus far to keeping the administrative side of things manageable has been to keep the magazine relatively small. But what of the future? What will happen if LR expands beyond our administrative capacities? Mura’s observations (and the ensuing responses by Chee and Freeman) touched on a very real concern for us, and served as a good reminder that in order to avoid burnout, we will need to be humble enough to seek out help when it’s necessary while remaining practical enough to stay grounded in whatever way we can. 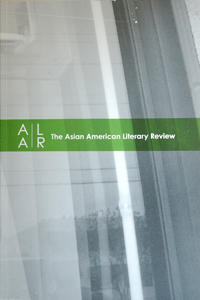 The editors’ choice to open with insights from Mura, Freeman, and Chee did well for the magazine’s ethos; it established a precedent of inviting real conversation between members of the community that AALR proposes to represent. The boldness and diversity of the three forum participants’ views speaks not only to the wide range of perspectives amongst Asian American writers, but also transparently acknowledges the messy complexities of any project that sets out to “embody” or “represent” Asian American writing. I am curious as to whether the editors plan to retain this feature as a regular part of the magazine; I would love to see more forums, on different topics, in future issues. But to move on to the poetry: I appreciated that the editors chose to give about half of the issue’s pages over to the genre, and that they placed the poetry section first, right after the opening forum. Sometimes, I think, poetry can get skimmed over when it’s scattered throughout the pages of mixed-genre magazines (a very small poem can easily get lost when slipped in between lengthy prose contributions; in some publications, the inclusion of poems here and there almost feels like an afterthought). Not so with AALR. There was no way that you could have missed the powerhouse lineup of poems in this issue! Nor would you have wanted to, with the likes of Cathy Song, Nick Carbo, and other such notables gracing its pages. While I enjoyed the poetry section as a whole, two sets in particular really gave me chills. The first was a series of epistolary poems from Oliver de la Paz. The ferocity of de la Paz’s language, combined with the rhythmic crescendo effected by his downbeat-like repetition of “Dear Empire, / These are your ____” at the beginning of every new section, blew me away. Like an archaeologist, de la Paz builds up his portrait of Empire in shale-like layers, brushing away white space to reveal line after line of intensely electric imagery. The force of his speaker’s voice seems to vibrate through some brittle, conductive medium—glass, perhaps, or wire—rattling in and around each new line. “If you took a photo negative of me right now, you would see the heat outlines / of ghosts,” he writes in the third segment, “The upright caskets are violent with their exhaust. This is me placing / flowers on a stone. This is me besides the wisteria, twisted around the gate’s / trellis. These are your solar flares” (33). The sheer range of the imagery being employed here is amazing to me: in the course of a single stanza, de la Paz juxtoposes thermodynamics with supernatural beings, cemeteries with suburban gardens, and then zooms out wide to land us in the realm of astrophysics. The speaker’s relationship to the you (or “Empire”) is also deftly rendered. We get a sense of tired intimacy underlaid by a history of conflict and pain—like that of an estranged lover reflecting back on his or her abusive ex-partner. The speaker displays an intimate knowledge of the textures and idiosyncratic propensities of Empire: how in its evenings, “The dark has the texture of fur,” (34) how when asking questions or being questioned, “You fold your hands over a knee,” how the calloused hands of workers by the road seem to exist in a world entirely separate from that inhabited by speaker and addressee: “they bear no resemblance to us. To your beautiful hands” (36). And yet there is little tenderness to the tone of the speaker’s address. Rather, there exists an ominous closed-ness that is at times almost clinical. In the case of the hands: “The above must be expressed flatly as to deny one’s office. Your hands are beautiful. To deny would simply provoke a question” (36). Other times, the understatedness of the speaker’s tone takes on the color, though never the outright manner, of protest. In the fifth section, the speaker’s disgust and resentment at being left to “starve in the jungle while your generals smoke tobacco we had dried all month” is projected onto an image of captive monkeys. It’s the image of the manacled monkeys that the speaker terms “most audacious,” though we readers are equally as horrified by the image of humans being kept captive and naked in the jungle. Protest, within this series of poems, is kept beneath the surface and tightly guarded, but it is all the more powerful as a result: rather than exploding bombs above ground, de la Paz allows us to experience subversion via subterranean tremors. We are shaken not because we know exactly what is wrong, but because although we are given a sense that something is wrong, we are never given enough information to fully explain it. Was it plain? Was it the fabric’s texture, not pattern, that showed on her skin? No, the fabric was patterned, and the pattern burned into her skin. The uncertainty of the details in the speaker’s mother’s narrative makes the scene being described feel more like an inescapable nightmare than a concrete event, and renders a complete grappling with the source of this trauma (and thus, healing) impossible. Heck’s speaker is left with what might be thought of as an inherited melancholia. As pieces of the original traumatic event recede further into memory from one generation to the next, they acquire the elusive properties of a flashback dream. ‘Maybe, maybe’ becomes a refrain that accompanies the account as it is passed down, and the narrative gaps that the “maybe”s cover become a source of further wounding with each retelling. Craft-wise, Heck probes the suffering caused by the a-bomb with a quiet, but deeply distressing intensity. Her poems, with their juxtaposition of mechanical language and images of human anguish, accomplish a terrible serenity, in which the delicate choreography of moments like “Hard to remember the spark in first person, the tipping, / if the arms flew up or down” (“Spark,” 60) is belied by our knowledge of the reason for the action being described (a body being thrown during the detonation). Later in the same stanza, lush pastoral imagery oozes from the victims’ wounds: “A spot on her cheek /continued to weep. You wanted to see the colors / of fall leaves, to pick apples in the hills.” The effect of the contrast between the known reality of the emergency being described and the polished smoothness of the language Heck employs is—like some eyewitnesses’ descriptions of the bomb’s flash itself—at once rivetingly surreal and absolutely terrifying. With such a strong start, AALR seems to have established a good footing for itself. I look forward to watching its development in future issues. Issue 2 (due out in September) is also set to contain only solicited pieces, but the editorial board is currently taking open submissions for Issue 3. I will be curious to see how the editors bridge this transition. If the quality of the content and editorial work in Issue 1 is any indication of what is to come, however, I am confident that readers will have nothing to worry about. AALR seems to be a smoothly managed, sophisticated, and most of all—smart—operation, and I think it can look forward to having a long, successful life ahead of it. I, for one, am already on the edge of my seat in anticipation of the next issue. September cannot come fast enough.